On 27th June, we will be part of group who will present the petition you have signed to No.10 Downing Street. We will be asking for a Defamation Bill that will make the libel laws fairer, more accessible and in the public interest. Will you help us and let MPs know that the Defamation Bill currently passing through Parliament is still inadequate? For example, the Bill lacks a public interest defence, which is what those writing on matters on public interest desperately need. The unfair libel cases (Singh, Goldacre, Wilmshurst, etc) that sparked the Libel Reform Campaign could all happen again without a public interest defence. 1. Please send an email to your MP if you have not done so already last week. You can find a template email and instructions for contacting your MP here http://www.libelreform.org/news/527-write-to-your-mp2. Please tweet: “Support #LibelReform by signing the petition http://bit.ly/8gJQ7w - if you’ve signed already, click http://bit.ly/LvOqrG to remind your MP”3. Please forward this email to 5 people who you think care about free speech and ask them to write to their MP and tweet. Finally, please join us all at the Houses of Parliament on 27th June at 10.30am immediately before the delivery of the petition to Downing Street. A large show of support will impress upon MPs that many people are committed to winning the battle for a fairer defamation law. You can find details of what to do and where go here. Let Mike and Síle know if you can come at news@libelreform.org so we can save you a space. MMR does not cause autism. There is no controversy about this. Medical experts agree. There is no epidemiological connection between MMR and autism (in Denmark, England, Japan, Japan, Japan, Poland, and the United States), papers alleging a connection have been retracted, no one has ever reproduced the "MMR measles virus infiltrates gut, causes autism" claims of Andrew Wakefield and the largest court hearing, the Autism Omnibus trials in the US, has denied all three test cases and appeals for the various "autism is caused by vaccines" hypotheses. The media hype, largely responsible for the drop in MMR uptake in the UK and subsequent mumps and measles outbreaks has died down, parent confidence is rising, and MMR coverage rates are picking up. Their lawyer, Luca Ventaloro, is a well known Italian anti-vaccine advocate (seen here on YouTube explaining how to legally avoid compulsory vaccination). And while their doctor, Massimo Montinari (misspelled as Montanari in the court decision), has no proper biomedical research papers on autism or MMR or vaccines in general, he authored the book "Autismo: i vaccini fra le cause della malattia" and sells his own autism "cure" protocol. Why the defendants, the Italian Ministry of Health, apparently did not present any of the huge body of evidence against any association between MMR and autism is not clear. Ironically, the Cochrane Team reviewing the MMR is Italian. After the ruling, horses bolted and all, it appears that this decision will be appealed. Already, the Italian Federation of Pediatricians has protested and pointed out the poor factual basis on which the court's decision was made. MMR: A mother's victory. The vast majority of doctors say there is no link between the triple jab and autism, but could an Italian court case reignite this controversial debate? What they obviously mean is "let's help them reignite the debate, so our web site gets clicks and our paper sells copies - yeah". 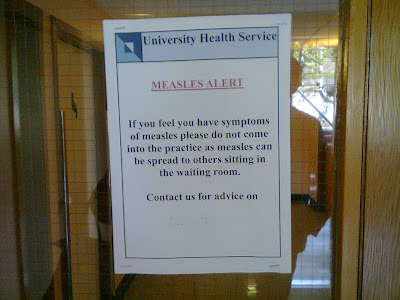 That kind of fear mongering is highly irresponsible in the light of the lack of evidence for a connection between MMR and autism (see above - interestingly, Autism Omnibus verdicts never made the Daily Mail) and record measles outbreaks across Europe and the UK. A fellow blogger, equally astonished about this inflammatory piece of poorly researched journalism, now revealed the Daily Mail author's motivation. Sue Reid is just simply anti-vaccine minded, conspiracy theories, pharma shill allegations and all, although she seems to recognise that this is not popular and threatens libel action. If the comments are correct, she is no stranger to controversial reporting based on fabricated evidence either. In any case, the ruling is unlikely to stand very long - the inflammatory language used in the Daily Mail piece is likely to cost some children their health. The current measles outbreak in Merseyside has well over 300 patients, with a hospitalisation rate of 18%. Well done, Sue Reid and the Daily Fail. "The chickenpox vaccine is not part of the UK childhood vaccination programme, because experts think that introducing a chickenpox vaccination for children could increase the risk of shingles in older people." In Israel in a partially vaccinated population, shingles were associated with early (especially under the age of 1) infection with wild varicella and varicella vaccine was found to be protective. In Canada, shingles incidence in the vaccinated age group declined slightly, while it remained the same for older age groups. In Taiwan, the incidence of shingles started increasing before the varicella vaccine was introduced. The same was observed in the United States. In Australia, a slight increase on shingles rate occurred over the past 14 years, although this is not as ambiguous as the drop in varicella cases in the same time period, concomitant with the introduction of the varicella vaccine (see box 1 here). And finally, comparing countries with and without general varicella vaccine recommendations showed that shingles incidence seems to be independent of any vaccination programmes. UK analyses come to the conclusion that a general vaccination programme for varicella may not be cost effective in the first 30 to 50 years after introduction. However, as the picture above impressively demonstrates and systematic studies also show, the impact of varicella on children and cost to carers is not necessarily captured by data available through health service usage. The positive effect of varicella vaccination on pediatric health is undebated: between the introduction of the varicella vaccine in the US in 1995 and 2006, disease incidence fell by 57% to 90%, hospitalizations by 75% to 88%, deaths by >74%, and direct inpatient and outpatient medical expenditures by 74%. Varicella vaccination reduced the risk of pediatric stroke, a known complication of chicken pox also in the UK, by over 60% (similar observations were made in Italy). What can I say? Have another look at that photograph - if you are in a country with a varicella vaccination programme, go get the vaccine. If you are in the UK, consider going private for the varicella - it is not fair that you have to pay out of pocket for a vaccination that will ultimately not only benefit your child's health, but also the NHS and your employer, but I would still consider this a good investment. If you are in the UK and you have gotten the varicella vaccine privately, please leave a comment and tell us where and how much it was as a resource for other parents. Lovely Dr. S said that while he was happy to actually see a case of measles (young doctor in the post-vaccine era that he is), people would tend to forget that measles can be a very dangerous disease. And indeed, in Merseyside, where they have had over 200 cases of measles this year, 25% of over 15 year old patients (15 of 61) were hospitalised, the highest rate of all age groups (<1s: 24%, 1-5s: 20%, 5-9s: 4% 10-14s: 8%). Apparently, University Health Service are also seeing lots of mumps and chicken pox, several cases of rubella and whooping cough. The nurse I saw was very impressed with the recent case of whooping cough - the first she had ever heard. She said she had heard a lot of coughs in her career, but the second she heard this one, she knew it as pertussis and "really something else" (in the sense of something much more severe that a normal cough). Make sure you are immune against measles, mumps, rubella, chicken pox, whooping cough and meningitis. If you don't have one of these, contact your GP, they should have your shots on file. It is your responsibility now.